Balboa Park, just off I-5 in San Diego is a great place to take the family or just hang out, with or without a camera. There are museums, gardens, fountains, and plenty of places for the kids to run around. Within Balboa Park is the Japanese Friendship Garden, an incredible place to shoot with a camera or to just walk around! It has been open since 1991 and if you weren’t looking for it you might walk right by. The Garden is located in a semi-secluded little canyon within Balboa Park and is marked by a Japanese style gate at the entrance. The above photo, Friendship, was taken with a Canon EF 24-105mm f/4 L IS USM lens at f/10, 1/80 sec, focal length 65mm, and ISO 200. This is a pretty typcial view of the garden during the spring. The cool thing about this garden is that there is so much to shoot once inside. Because the Japanese Friendship Garden sits below Balboa Park, you really feel like your somewhere else and not sitting in the middle of San Diego. In and around the gardens are one little subject after another. In the photo at right, I shot the door knob but there was also the opportunity to shoot more. I could have captured this beautiful door itself or the items in the background like the lilac trees, the pavillion, and the flowers growing on the pavillion. In this photo, called Garden Door, I wanted to capture the door knob without losing sight of where I was shooting. I needed to keep that door knob tied to the garden in the background or this was just another fancy door knob. To make the most of getting great photos, get to the garden when they open at 10am, or going on any cloudy day, seems to work best. There are also waterfalls, rocks, and little ponds that contain what I believe are Koi fish, they are also amazing and worth capturing. These little nooks and cranies don’t photograph well in bright sun. This photo on the left is called Lilac Pond, and when I go back I plan to spend more time at this location! This park is literally filled with traditional Japanese garden structures everywhere, including quite a few lanterns that I also plan to dedicate more time to as well. In fact, I had NO idea what these things were until I got home and did a little research. What I did feel from them while in the garden was peace; if there was ever a garden structure that begged you to be quiet, it’s these. That’s why I called the photo at left Quiet Please. These really do make for interesting photos! Throughout the Japanese Garden are plenty of flowers as well on the trails and hills, most are labeled. Planning a trip in springtime around mid-May seems would be a great time to catch everything in bloom. 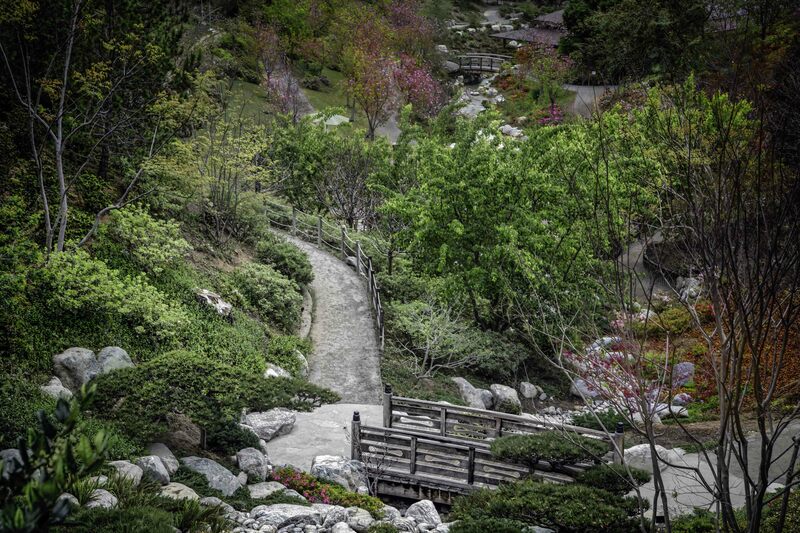 The below photo is called Serenity and was taken on the trail that heads from the upper to lower garden. Prev Post: Interview #2 Crazy Mind! Next Post: NEW Peak Design Bags!